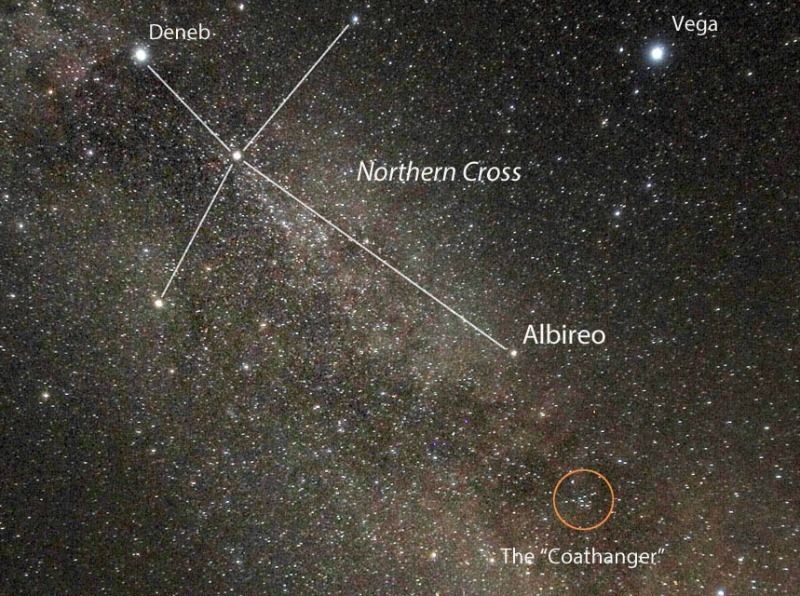 The star Albireo – part of the Summer Triangle – is your ticket to finding the Coathanger star cluster. It resembles its namesake and is easy to spot through binoculars. 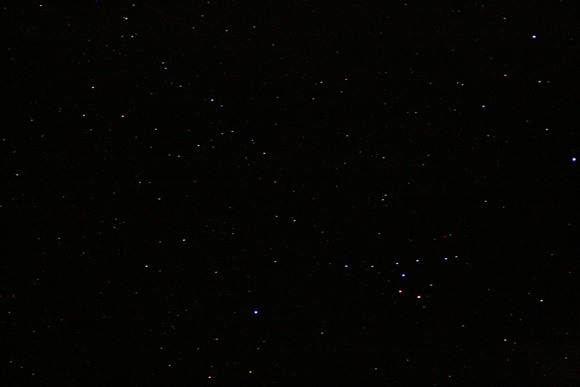 The Coathanger or Brocchi’s cluster is a tiny asterism – pattern of stars that is not a constellation. This star formation looks exactly like its namesake, and is amazingly easy to make out through binoculars. The whole trick to viewing the Coathanger is to know just where to look. As a prerequisite, first find the star Albireo in the Northern Cross asterism. The Northern Cross is actually a clipped version of the constellation Cygnus the Swan, with Albireo depicting the Swan’s eye or beak. The entire Northern Cross asterism is within another famous asterism, the Summer Triangle. Albireo is found at the base of the Northern Cross. Got Albireo? Now for some specifics on finding the Coathanger. With binoculars, look for the brightest star in the vicinity of Albireo. That star is called Alpha Vulpeculae, which appears as a double star through binoculars (though the two stars are not gravitationally bound). 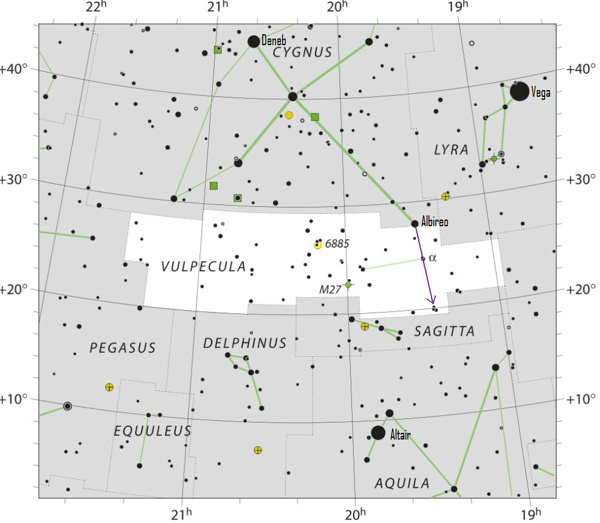 If you look, you can see Alpha Vulpeculae on the photo above; also look at the chart below. Draw an imaginary line from Albireo through Alpha Vulpeculae to locate the Coathanger. 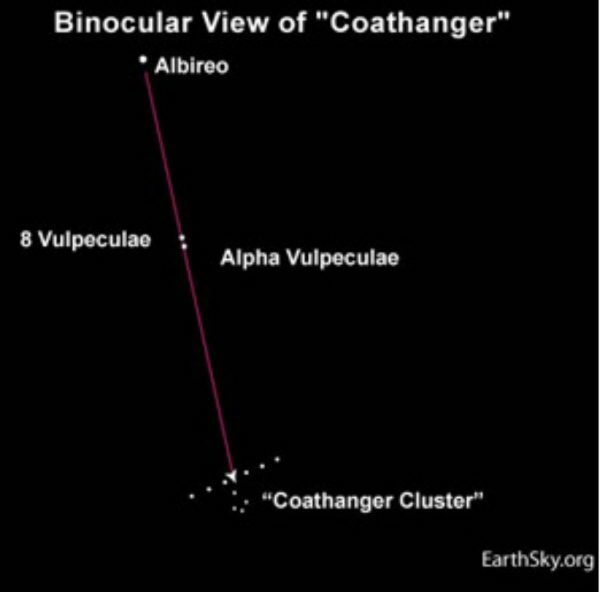 In most binoculars, Alpha Vulpeculae and the Coathanger fit within the same binocular field of view, though just barely. View larger. | An imaginary line from the star Albireo and through the star Alpha Vulpeculae takes you to the Coathanger. Notice that six stars form the bar of the Coathanger, while four stars make up the hook. From mid-northern latitudes, the Coathanger often appears upside-down. That’s why some people call it the Ski Lift. Hint: The Coathanger is tiny. If you keep getting lost while using your binoculars, place it at the top of a tree (or building), then your landmark upward with binoculars until you catch sight of the object. When should you look? Our sky chart above shows the stars as they appear from the Northern Hemisphere in middle July around midnight (1 a.m. Daylight Saving Time). Because the stars return to the same place in the sky some 2 hours earlier with each passing month, this sky chart also shows star positions for about 10 p.m. (11 p.m. Daylight Time) in mid-August, 8 p.m. (9 p.m. Daylight Time) in mid-September and 6 p.m (7 p.m Daylight Time) in mid-October. Since these stars shine from south to overhead at these times (as seen from the Northern Hemisphere), you might want to sprawl out on a reclining lawn chair, with your feet pointing southward. A reclining position saves on neck strain. Incidentally, the Coathanger – aka Brocchi’s cluster – isn’t a true cluster, but a chance alignment of physically unrelated stars. Photo of the Coathanger cluster (on the lower right). Image via our friend Jean Marie Andre Delaporte. Thank you, Jean Marie! Bottom line: Star-hop to the Coathanger – a tiny asterism that really looks like its namesake – via the stars Albireo and Alpha Vulpeculae.